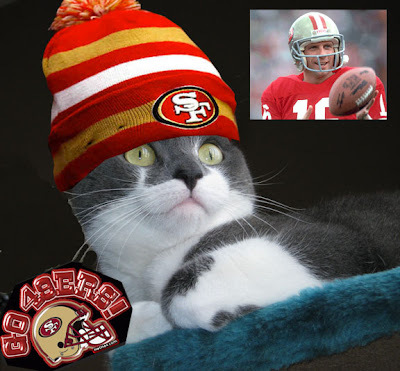 Spitty has had this photo of me dressed in my 49ers gear up on his blog for the past week but I thought I'd post it anyway cos TW is too lazy to make me a new one. That other team is for the birds. I'm sure you're wondering why someone in NJ loves a team in San Francisco. Seems when TW was younger, she had a big girl crush on their quarterback, Joe Montana. She said no one ever looked better inside a helmet than he did—that is, until she saw ME. Sweet! #16 Joe Montana. I'm ready to watch the big game! 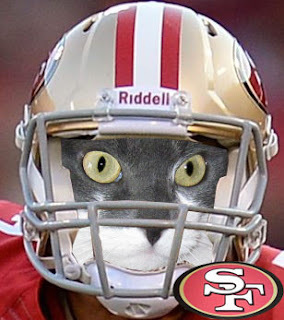 You make a helmet look good CK...go Niners! CK, you look just fantastic in your helmet and in your hat. Do come and join the Tabby Cats at the Tabby Cat Club Party!!! Looking cool Keisha. Enjoy the game. Have a serene Sunday. You look furry cool in that helmet CK ! I hope your team wins today! I am wearing the 49er colors today and rooting for them. A middle-aged colleague of hers was at a fancy-schmancy party a few years ago. JOE himself was there and the Colleague found herself standing right next to him at the bar with no one else very close around them. So she fumbled & gushed out some version of "Oh, I just LOVE you -- you were my favorite player ever" etc. etc. You know, the kind of nervous, girlish blather that happens sometimes to the Humans. Anyway, she said he was SO NICE to her and said, "Why thank you so much. I don't hear that so often anymore...."
We're rooting for the kittens. Anyone else will get us in trouble. We don't do football here. My human's idea of a hunky guy is Keith Richards circa 1971 or Robin Zander circa 1979... she will take either! The mom loved that Montana guy too, CK. We think the birdies are gonna get the bitey put on them. You're looking particularly good in your SF fan garb!! Raz is dressed in his Ravens shirt at the TCC party. Pawsome post CK, and I am gonna go back and link to the Tabby Cat Pawty. I sent them my link on FB to the CWB. Cross paws!!! You do look great in a helmet CK! They are sure to win with you on the team! ok we will excuse you for wearing that ridiculous get-up since you loved Joe Montana.....my Mom loved him too.....that being said.....he isn't there now and we want the 49er's to go DOWN! OMC, in that helmet you look like you're ready to get on the field! Looks like you are ready to put the fashion into football! CK, you are officially Super Stunning! The San Francisco colors really bring out the Stunning-iness of your furs. Mom agrees that this is great reason to root for a team when yours is not in it. Dearest CK, here it is right after the half and San Francisco is Losing! Me thinks Kozmo is going to has to eat Crow (er Raven) from Cinnamon! Also, we confess to being BIG-TIME baseball lovers here and only bandwagon football fans when the Niners are doing well. So we defer to smarter folk regarding strategic decisions.